Welcome to the third Atlantic Hurricance seasons thread! (Wow. 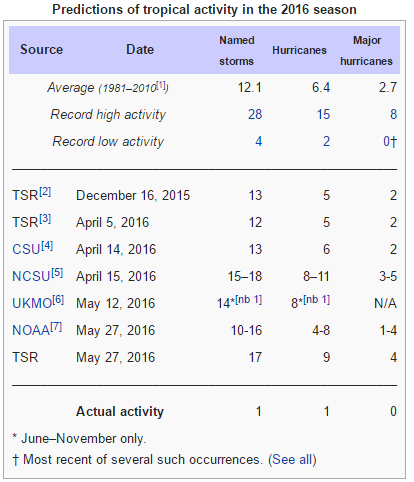 3rd year already) This thread will track the Atlantic Hurricane season in 2016 from small tropical depressions to category 5 super-storms (should there ever be any). This year I will only be doing very minor updates to the main page (as not many people look at it!). Most updates will be found as separate posts I make throughout the season. A prediction for this year by many forecasters can also be found on the bottom of this post to get a general idea of what this season could generally be like. And as we're in the UK, Ill try and track these storms even after they have turned extra-tropical and occasionally head towards the UK or Europe in general. The general season lasts from June till November, with the most active months being August and September, but outliers aren't too out of the ordinary. Enjoy. 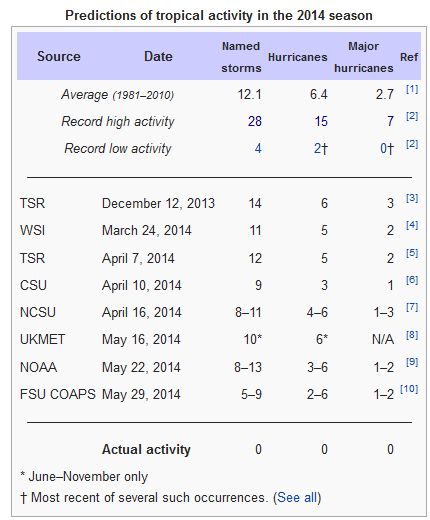 Hitting very early in the year in January, Alex was a Category 1 Hurricane that mostly stayed out in the Atlantic. It was the first Tropical storm to form in January since 1978, and only the 4th known on record, and the 2nd January Hurricane formation known on record. Tropical Storm Bonnie was a storm off the coast of the United States. It was the first land falling storm of this years season as a Tropical Storm (39-73mph). It brought heavy rain to parts of Southern Carolina and some surrounding states before exiting out into the Atlantic and fizzling out. Tropical Storm Colin is (as of the 5th of June), a storm off the coast of the United States. It is expected to make landfall in Northern Florida late Monday/Early Tuesday, tracking across Georgia before exiting into the Atlantic, tracking up the side of the most South-eastern states. Welcome to the second Atlantic Hurricane season thread! This thread will track the Atlantic Hurricane season in 2015 from small tropical depressions to category 5 super-storms (should there ever be any). The top post will have most of the information for these storms, with occasional updates in the thread below. A prediction for this year by many forecasters can also be found on the bottom of this post to get a general idea of what this season could generally be like. And as we're in the UK, Ill try and track these storms even after they have turned extra-tropical and occasionally head towards the UK or Europe in general. The general season lasts from June till November, with the most active months being August and September, but outliers aren't too out of the ordinary. Enjoy. Tropical Storm Ana was an early storm for 2015, making its appearance over the Bahamas almost a whole month outside the usual season. While Ana did make land contact in the US, it did not cause any significant damage. It reached max wind speeds of 60mph as it reached the South Carolina coast, before calming down into an Extra-tropical storm once it re-entered the Atlantic. 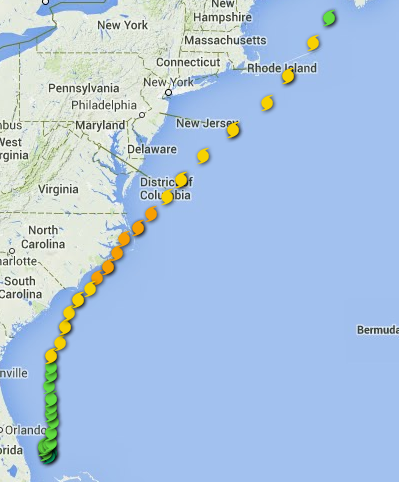 Being so early in the year, it becomes the 2nd earliest landfall a tropical storm has ever made on US soil. Tropical Storm Bill was a storm off the coast of Texas and made landfall in the same state with around 60mph winds. Although lots of rain fell, and some areas experienced flooding, it was luckily not as bad as others forecasted. However, the "Brown Ocean Effect" likely kept this storm alive as it took its path over the US, surviving as Tropical Depression status all the way to Kentucky. Tropical Storm Claudette was a storm off the East coast of North Carolina. A surprisingly high Tropical Storm, it tracked its way up the US Coast where it met its demise near Newfoundland. Hurricane Danny has made its appearance in the middle of the Atlantic, and after a quick build up to a Tropical storm, and then pause, reached Hurricane status on Thursday the 20th, and reached Category 2, and then Category 3 the next day on the 21st. Its expected to effect the Antilles as it moves over to the northern islands. 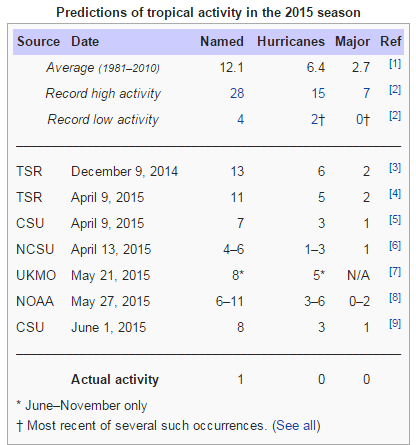 Welcome to the first Atlantic Hurricane Season thread of perhaps many more. This thread will track the Atlantic Hurricane season in 2014 from small tropical depressions to category 5 super-storms (should there ever be any). The top post will have most of the information for these storms, with occasional updates in the thread below. A prediction for this year by many forecasters can also be found on the bottom of this post to get a general idea of what this season could generally be like. And as we're in the UK, Ill try and track these storms even after they have turned extra-tropical and occasionally head towards the UK or Europe in general. The general season lasts from June till November, with the most active months being August and September, but outliers aren't too out of the ordinary. Enjoy. Category 2 Hurricane Edouard is a Storm currently in the Atlantic which will be expected to reach category 3 making it the first Major hurricane of the season. Some models believe that it may even reach Category 4 status, but this seems unlikely at this point. It's avoiding all major landmasses as of current meaning no immediate danger, however there is a possibility of the storm turning extra-tropical and heading towards Europe, but models recently believe that it will simply stay in the Atlantic and eventually die off. 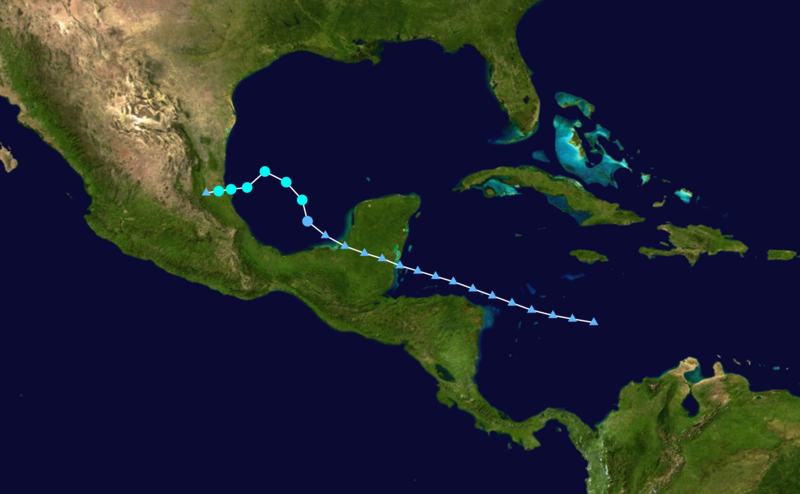 Tropical Storm Dolly was a small storm that developed near the Yucatan Peninsula, before making its way into the Bay of Campeche. Shortly after it made landfall as a Tropical Storm and dissipated over East Mexico. Hurricane Cristobal was a category 1 Hurricane that started North of Haiti and reached Hurricane strength within 3 days. The storm did not make significant landfall, however the storm in its later stages as a extra-tropical cyclone moved up towards Iceland, causing severe gales. 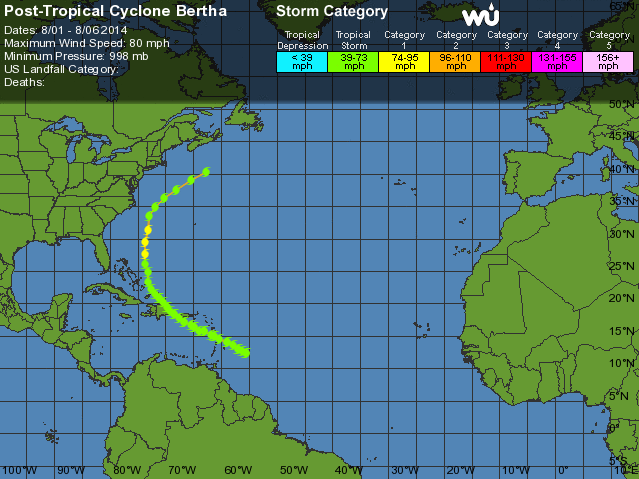 Hurricane Bertha was a storm that formed south east of the Caribbean. The storm only reached Hurricane status for a short period of time during its time as a tropical storm, and did not make landfall. Once reaching extra/post-tropical status, Bertha moved over the South of the UK as typical Autumnal low bringing wind and rain to the region before moving up the North Sea and affecting Scotland. Tropical Depression 2 started far away from land in the Atlantic, the storm quickly grew originally before dieing off a few days later. Arthur started out as a US land storm, unusual in itself as Hurricanes tend to develop from storms coming off the Cape. After the storm moved out over the sea off the coast of South Carolina, it sunk into warmer waters off the coast of Florida where it built into a Tropical Disturbance, and onto eventually a Tropical Storm. The storm then moved up the east coast where it strengthened to a Category 2 hurricane before making landfall in North Carolina (the first Hurricane to make landfall since Issac in 2012, baring in mind that Sandy was actually a Post-Tropical Cyclone when it made landfall in New York). The storm eventually became a Post-Tropical Cyclone and hit Nova Scotia in Canada. The storm will eventually merge with another low near Greenland and effectively dissipate according to current models, although some models suggest an approach towards the UK, but will likely be a typical low if so. Last edited by Lifeless on Mon Sep 15, 2014 1:19 pm, edited 56 times in total.